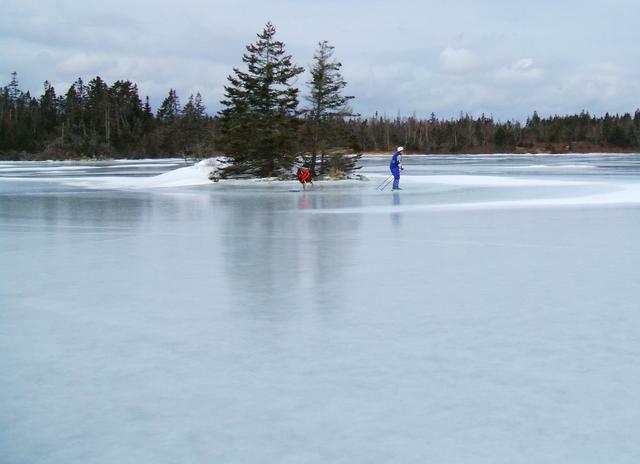 First Ice in Nova Scotia The ice was very late coming. 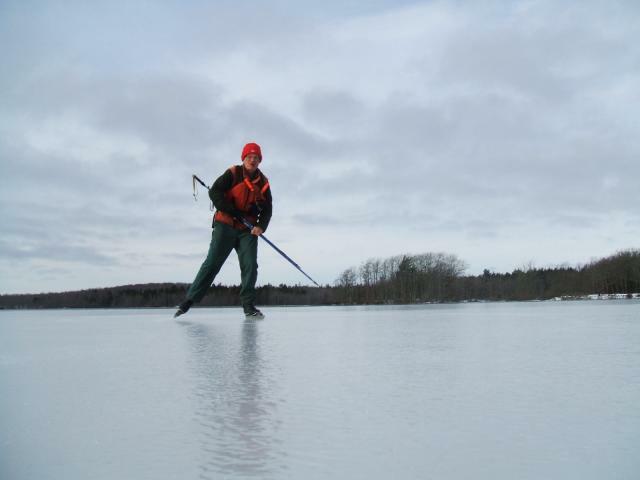 Finally a bit of cold weather in early December put some ice on shallow lakes. 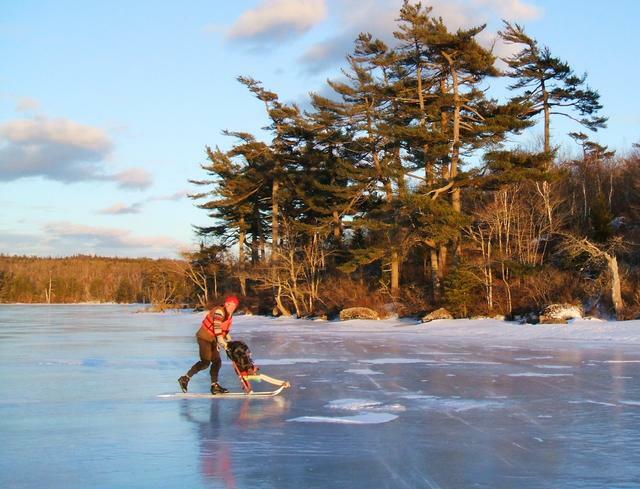 Unfortunately, very warm, rainy weather returned and all lakes were open until mid January! 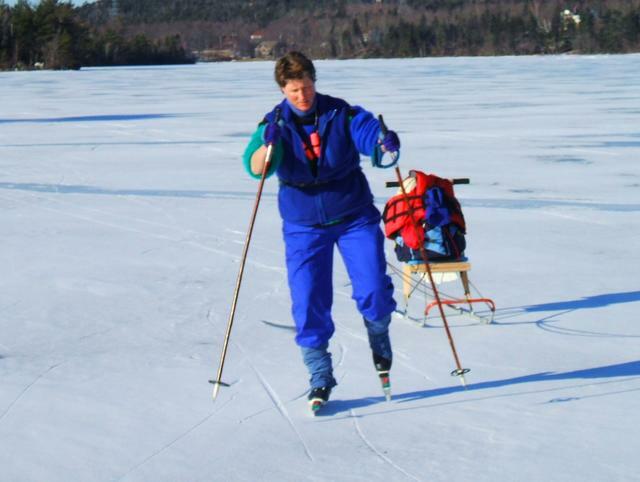 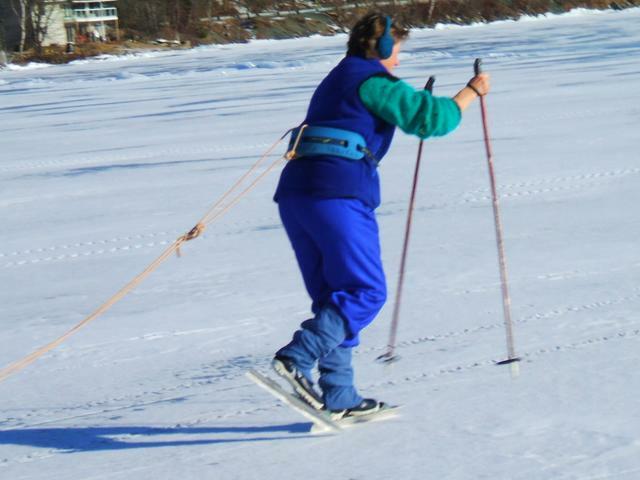 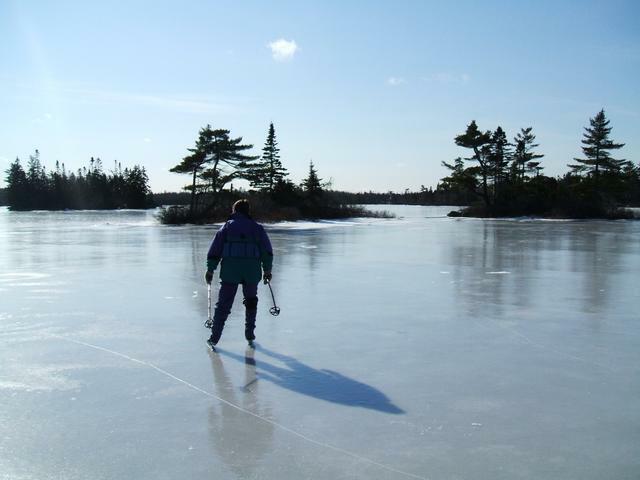 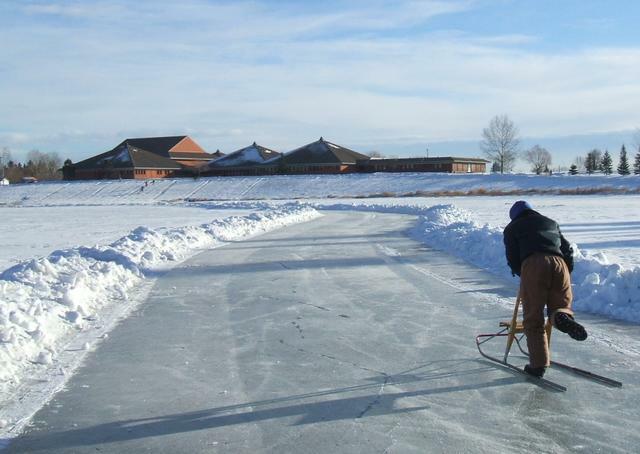 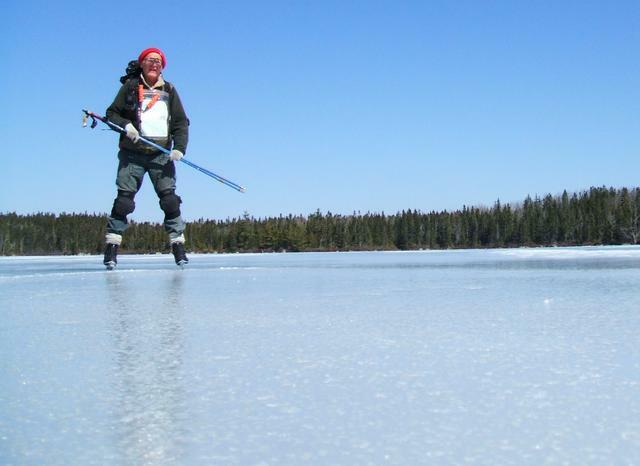 This winter, ice on Alberta lakes was covered with 10 cm of crusty snow, so skating conditions were very unfavourable compared to last winter. 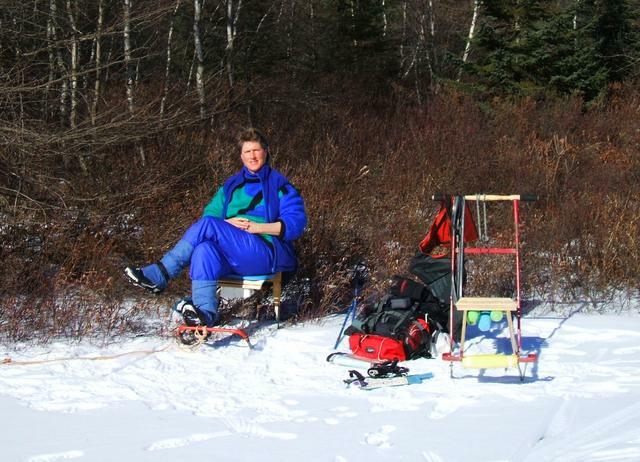 ( see also: photos of Alberta skiing 2006.) 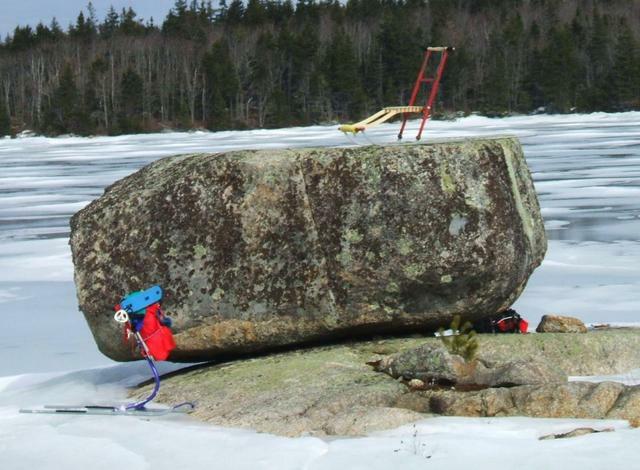 However, sometimes kicksledding on the crusty snow was faster than skiing. 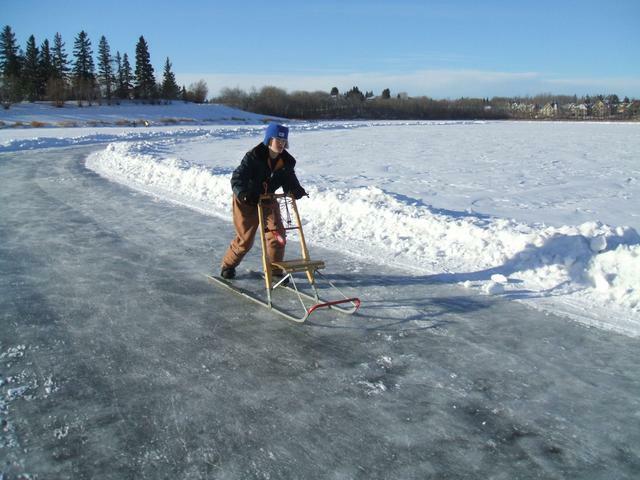 In addition, we found a 1 km long plowed ice track on Cranna Lake in Lacombe, which was excellent for fast kicksledding and skating. 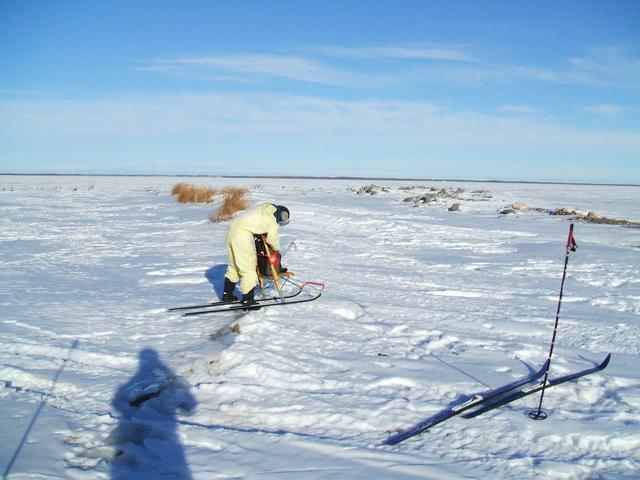 Bird Island Expedition, Buffalo Lake, Alberta Thomasina and I returned to Bird Island on Buffalo Lake, it wasn't as fast a trip as last winter. 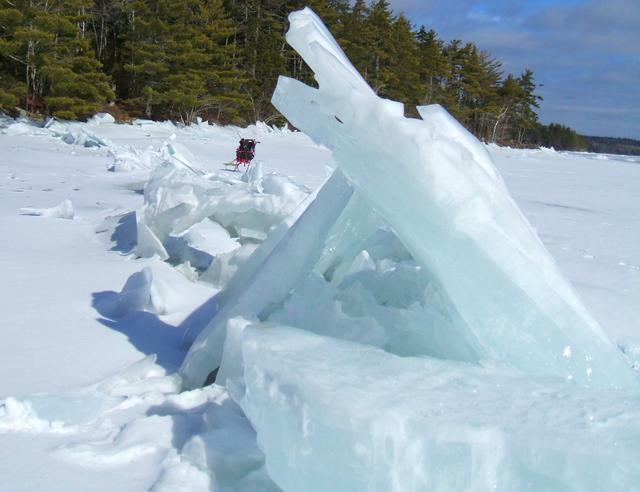 FINALLY, we get some ice-forming weather! 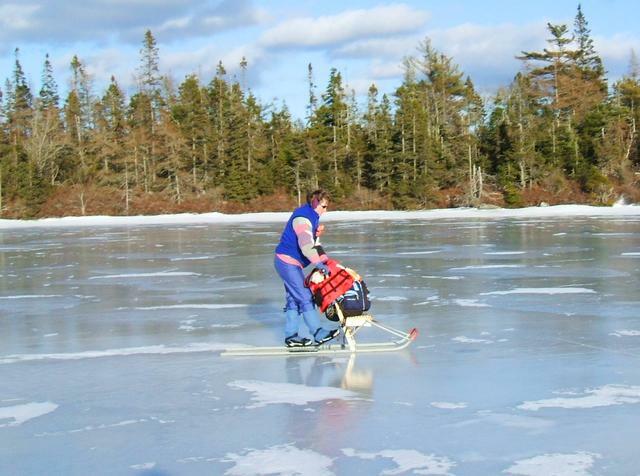 Blowing snow falling on wet ice made a rather rough surface on lakes in the Wolfville area, but they were good for kicksledding. 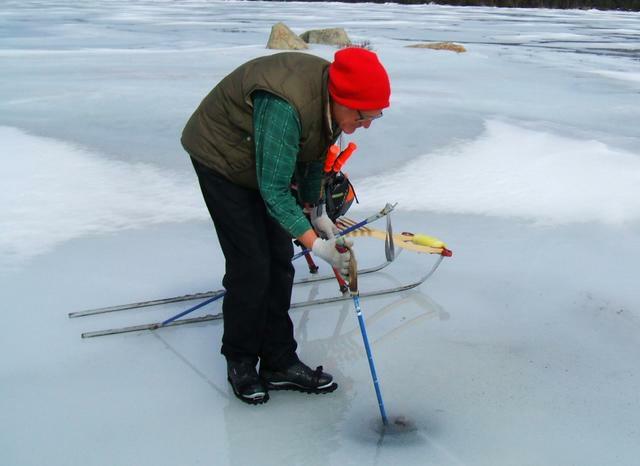 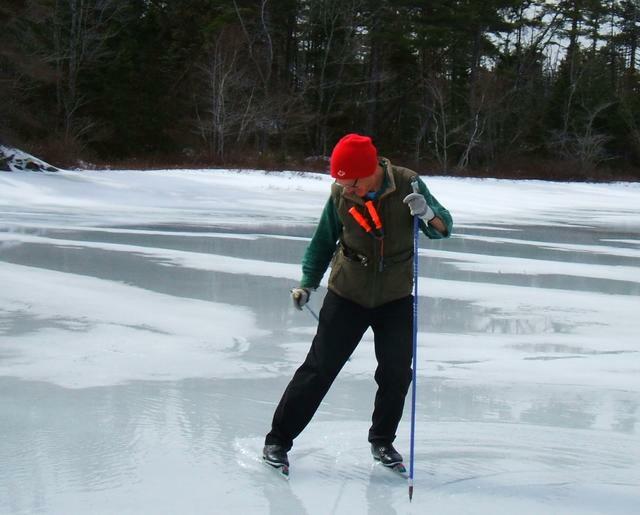 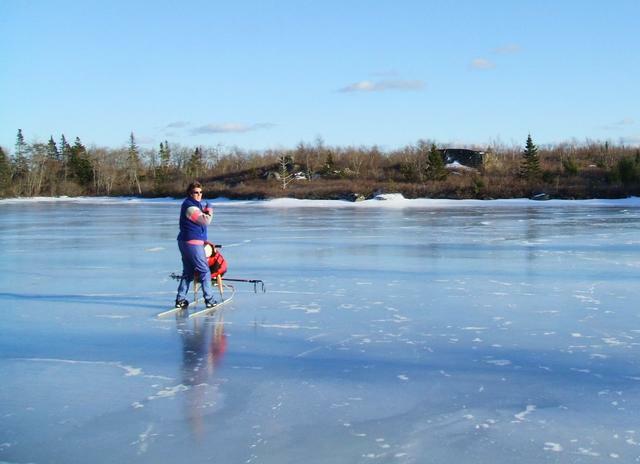 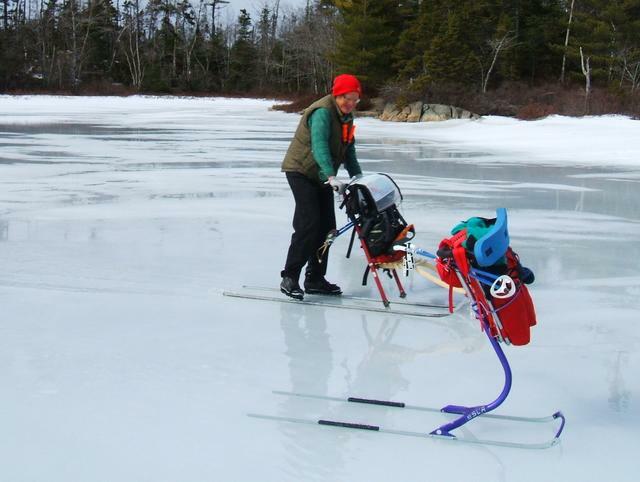 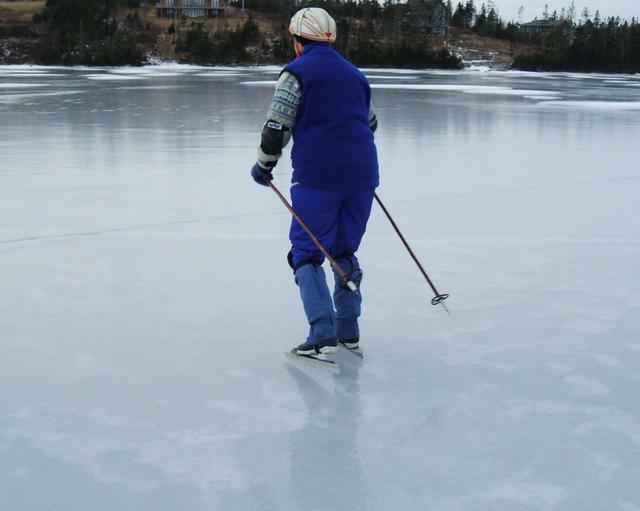 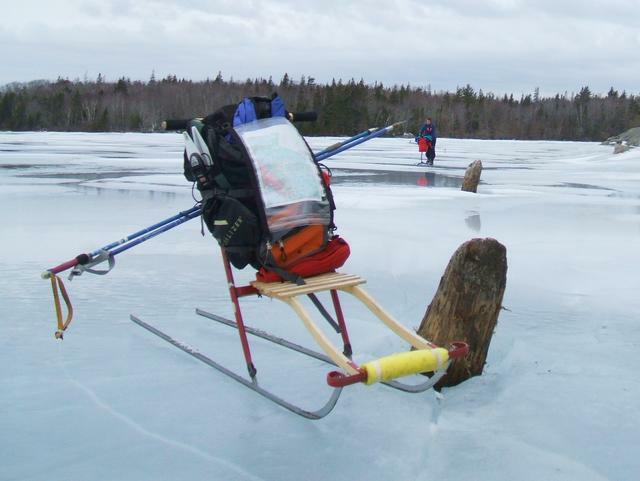 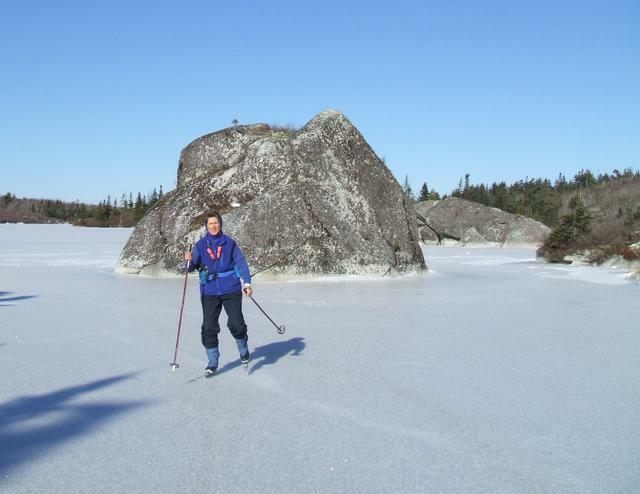 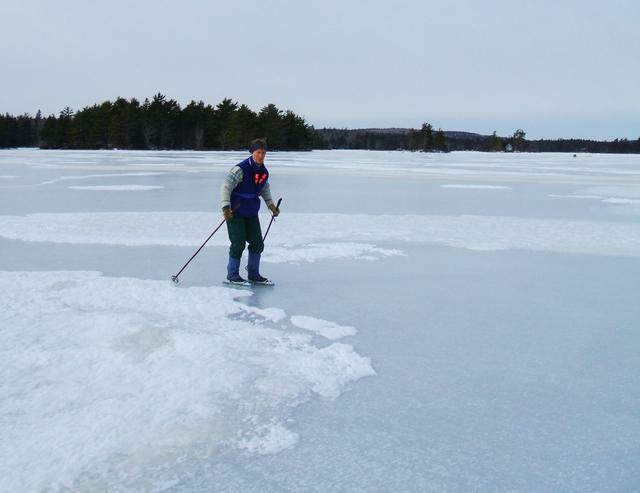 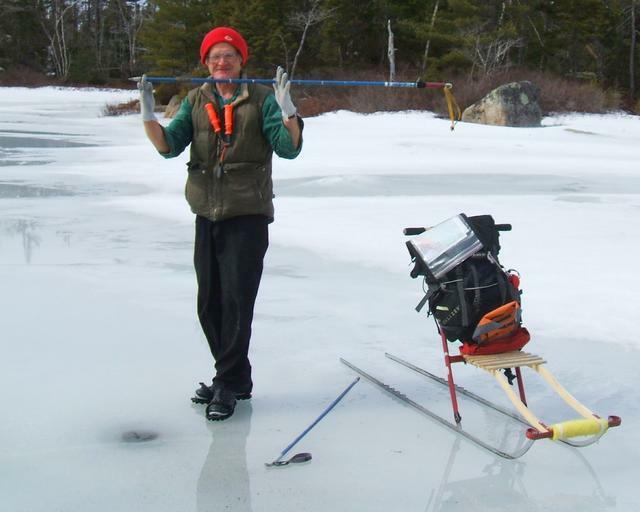 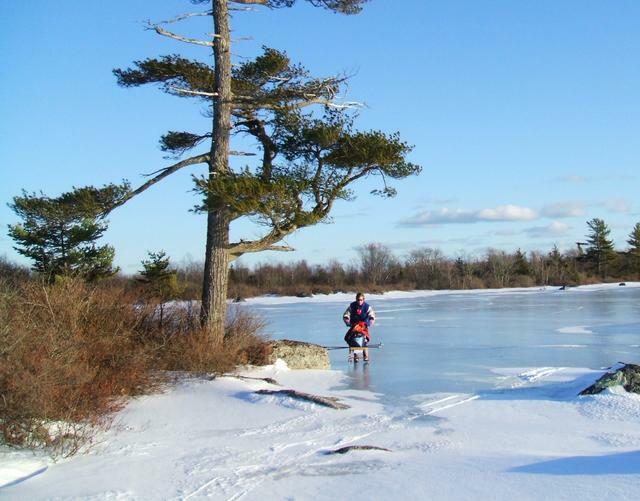 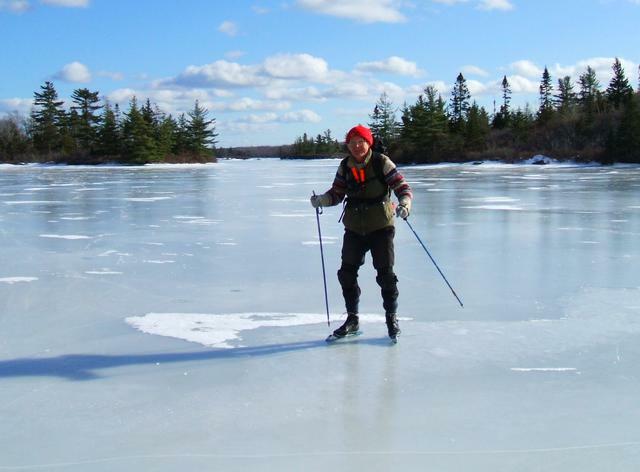 There were also strips of good skating ice on Black River and Gaspereau Lakes. 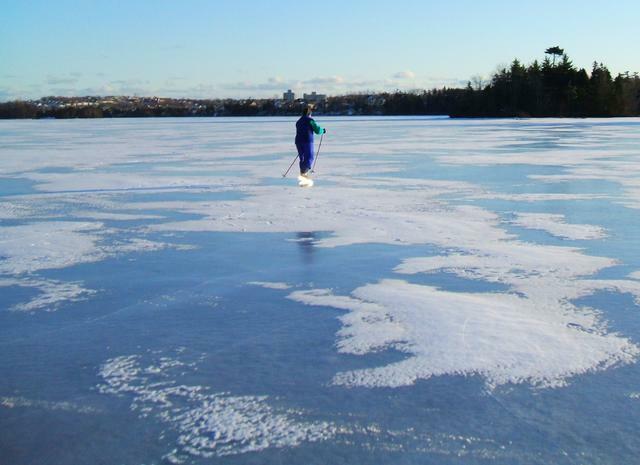 Lakes in the Halifax area were rumoured to be very smooth - but which lake should we try? 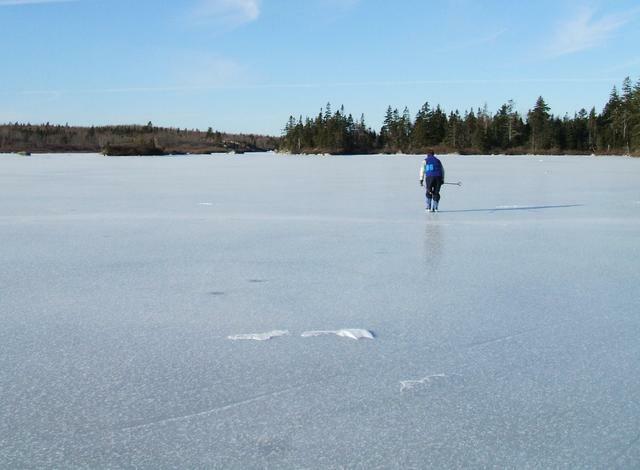 We chose rather small Cranberry Lake, Timberlea, about 10 km west of downtown Halifax. 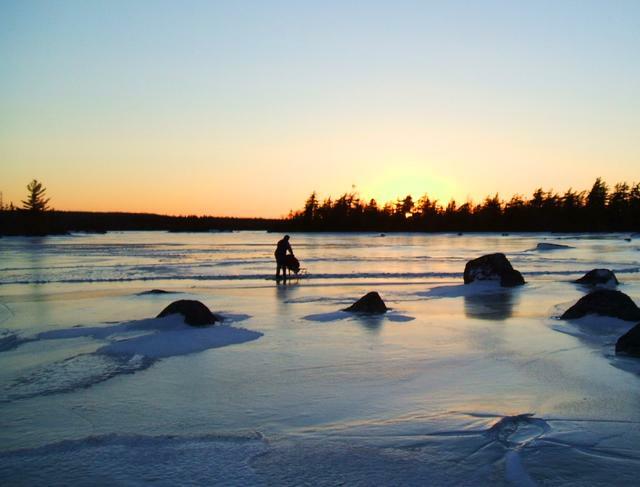 It is about 2 km long and 100 m wide, with numerous islands and coves. 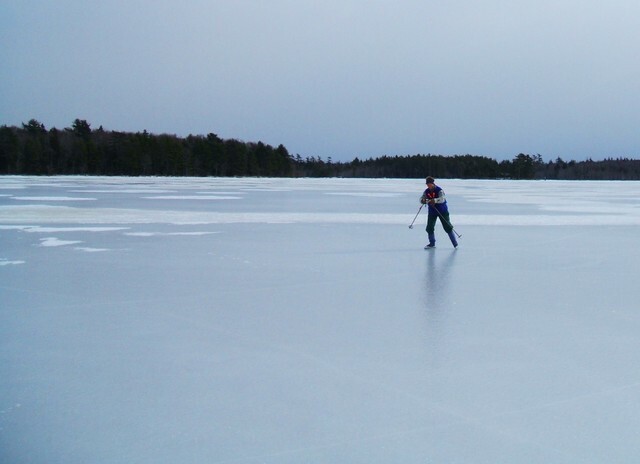 We kicked once around the entire shoreline (about 5km) and skated two laps, trying to see every nook , cranny and skerry on the lake. 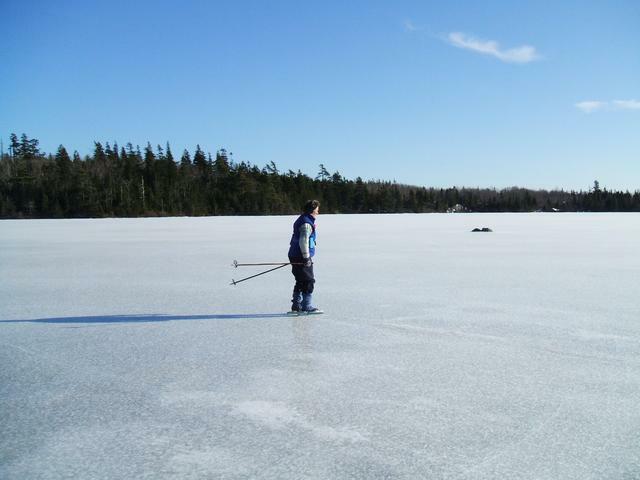 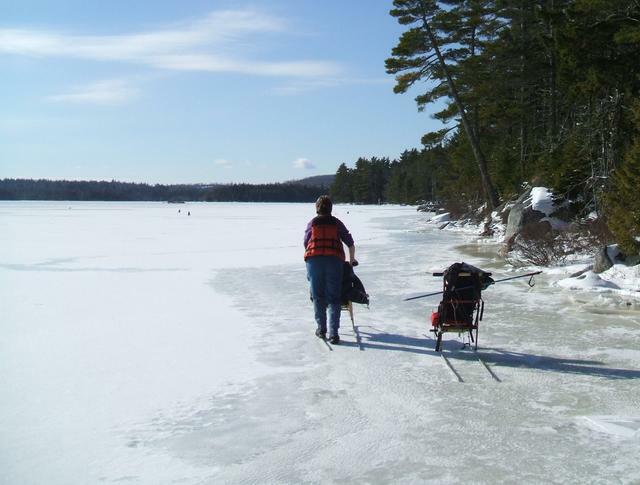 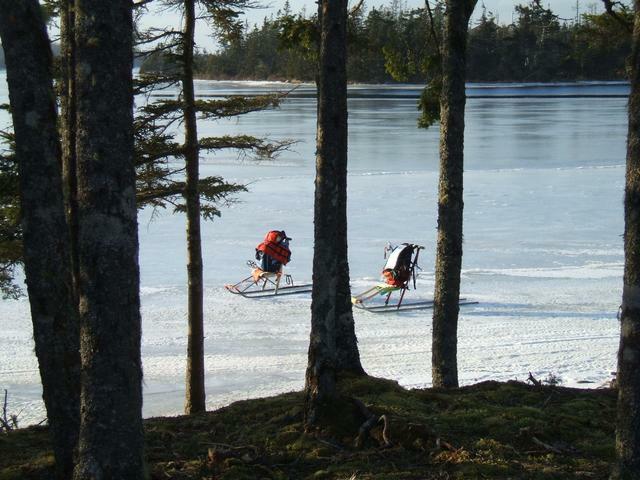 We also portaged to Pot Lake and skated once along its shoreline (about 1.5km). 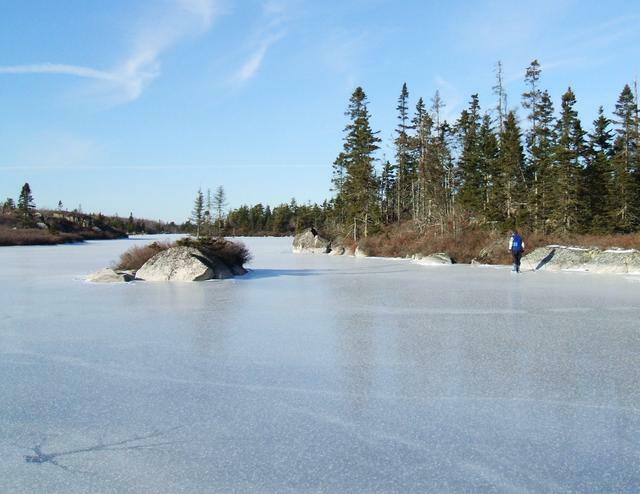 The rugged terrain protects this area (The Bluff Wilderness) from urban development. 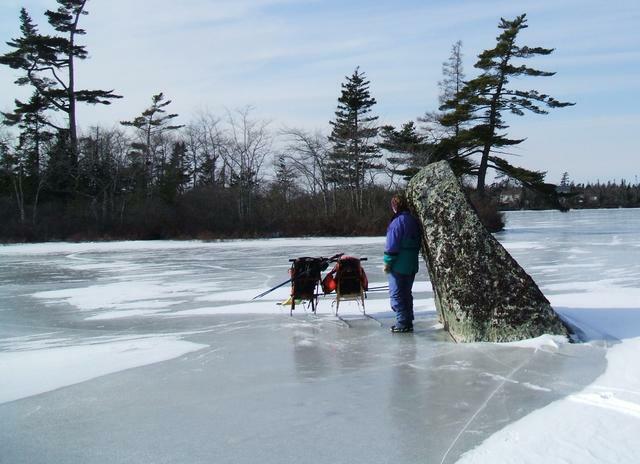 Cranberry Lake, Ice Troll's Cave? 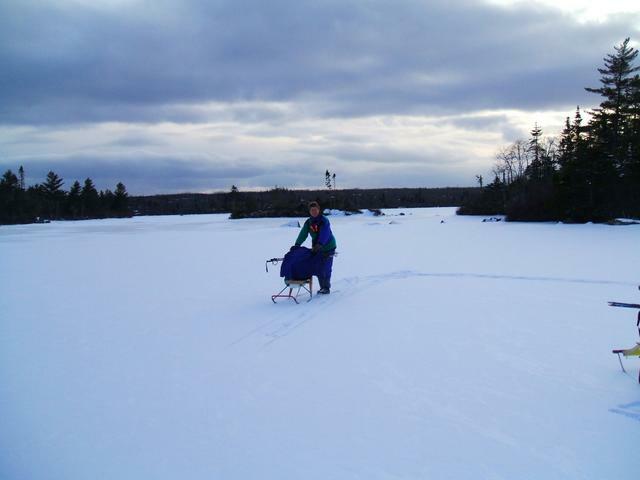 Jan 28 2007 Black River Lake A repeat of the Jan 24 trip on this lake. 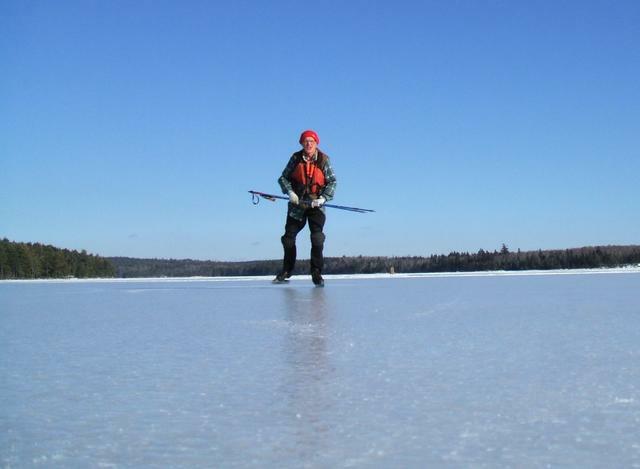 We did a 30 km round trip to Toney's Island at the south end of the lake and skated on several smoother sections. 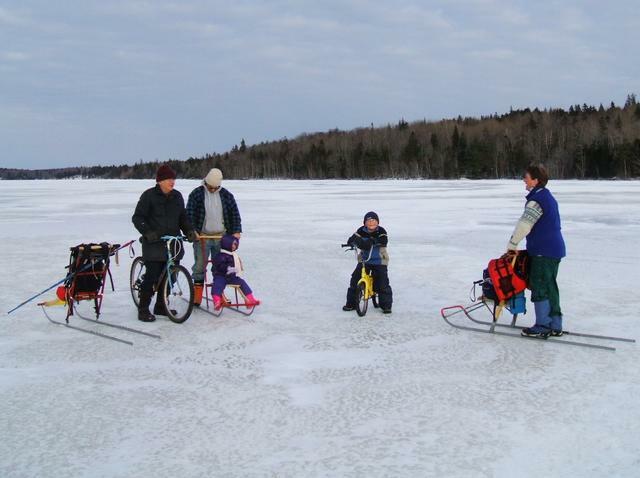 We met Arnold, who also owns a kicksled, but today he was riding his bicycle while some friends were using his sled. 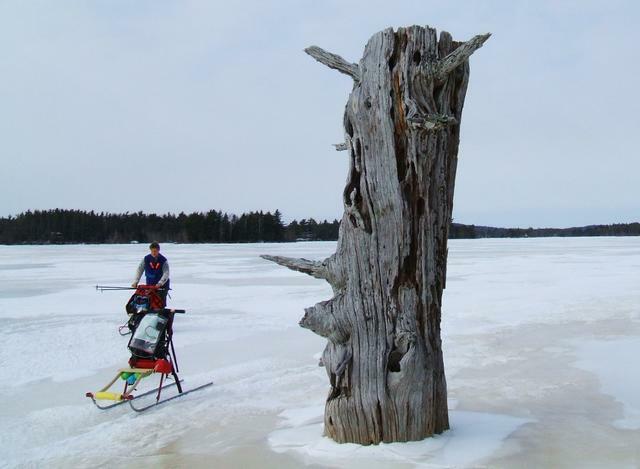 Black River Lake: Wooden troll? 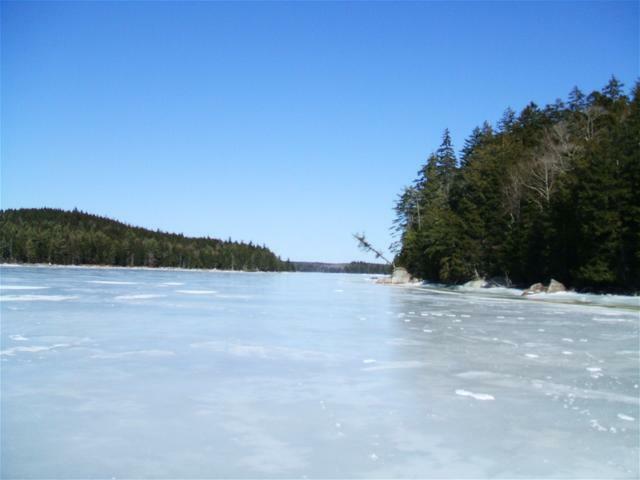 Five Mile Lake is a nice wild lake between Windsor and Halifax. 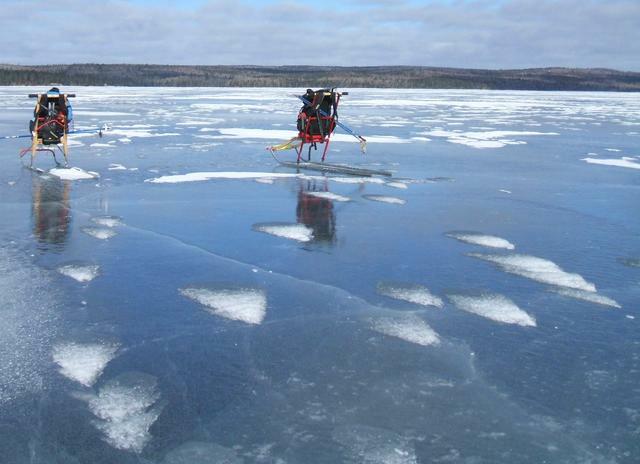 It is 10 km long but only averages 1 km wide and has numerous islands, skerries and cliffs. 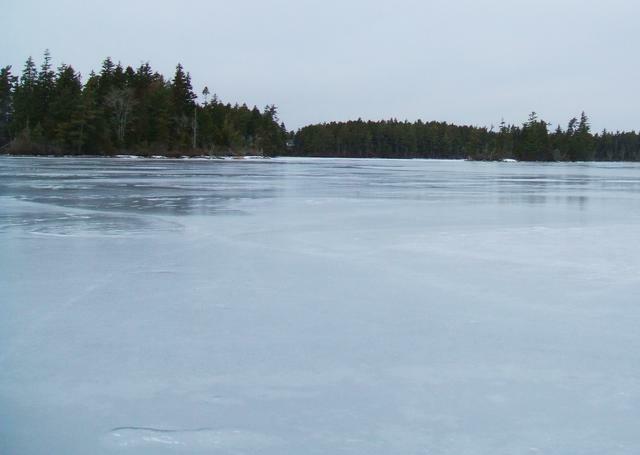 Today the ice was quite smooth with just a light snow cover. 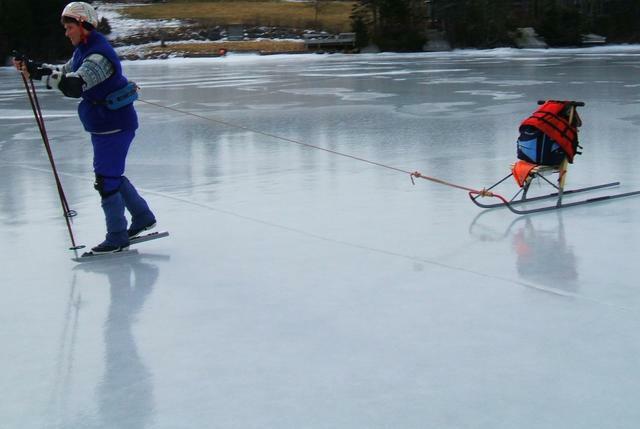 Total distance on kicksled and skates was about 25 km. 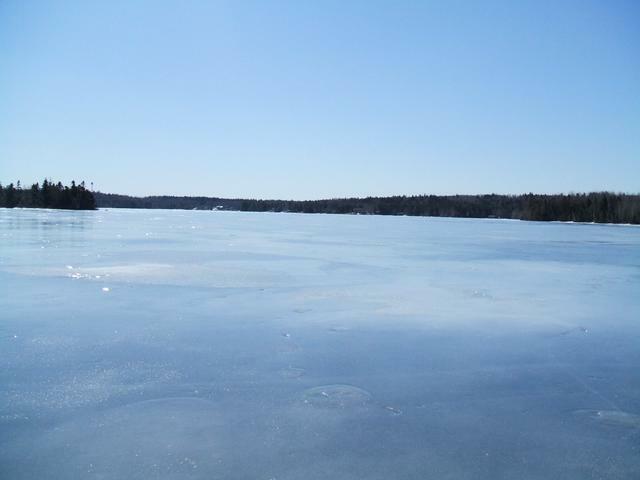 I drove back to Halifax, picked up Lesley and drove out to Timberlea, about 15 km west of the city. 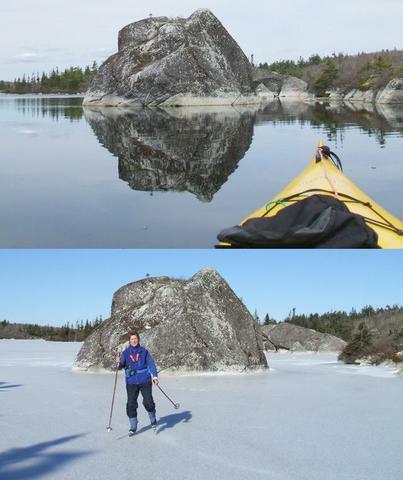 This time we did a bigger lake, Five Island Lake. 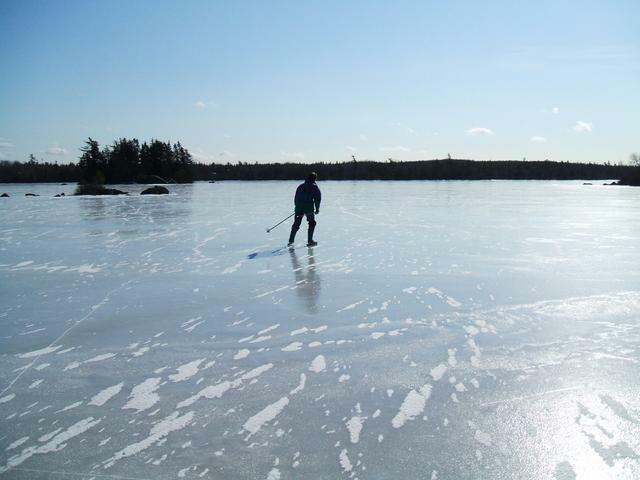 We cruised the whole shoreline, about 15 km, and also skated about 10 km on excellent ice. 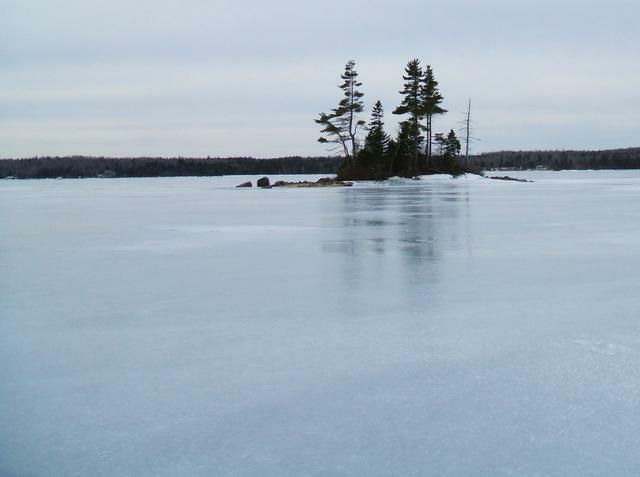 Five Island Lake, 3 islands There are at least 7 islands on Five Island Lake! 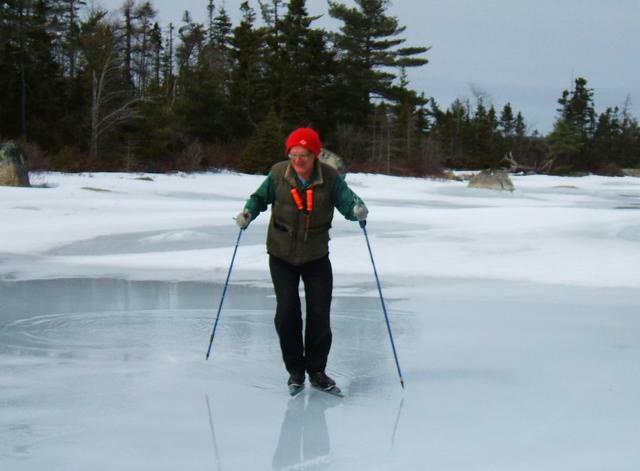 Wolfville area got about 30 cm of snow on the past week, good skiing, but no skating or kicksledding. 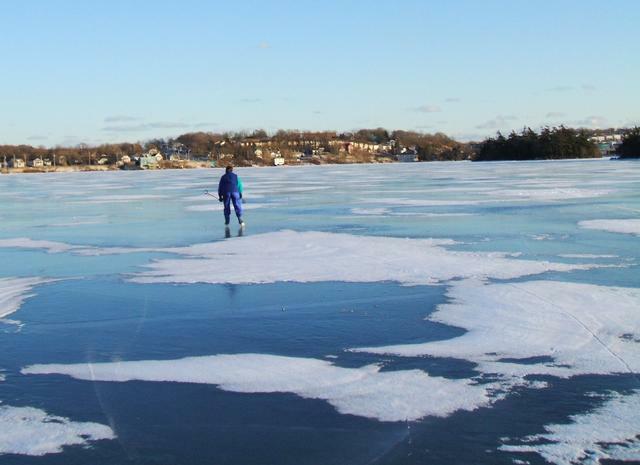 So I spent 2 days in the Halifax area. 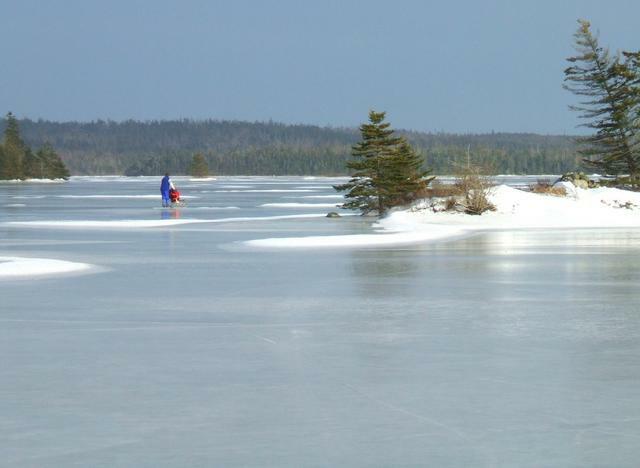 Hubley Big Lake, about 20 km west of the city, had about 3 cm of snow. 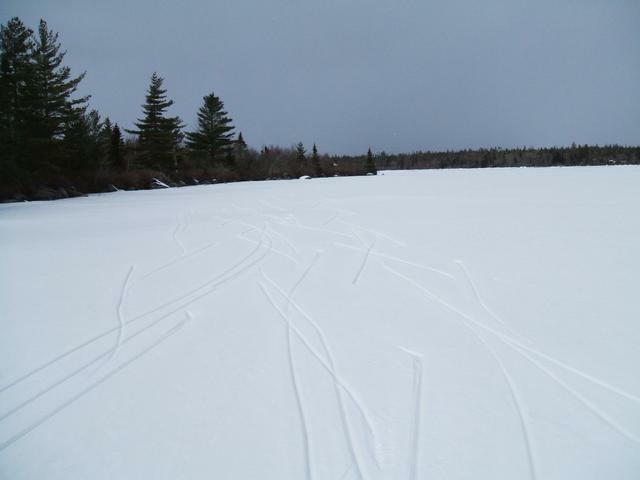 In lee areas (along west side of the lake), the snow was loose and offered little resistance to either skates or kicksleds. 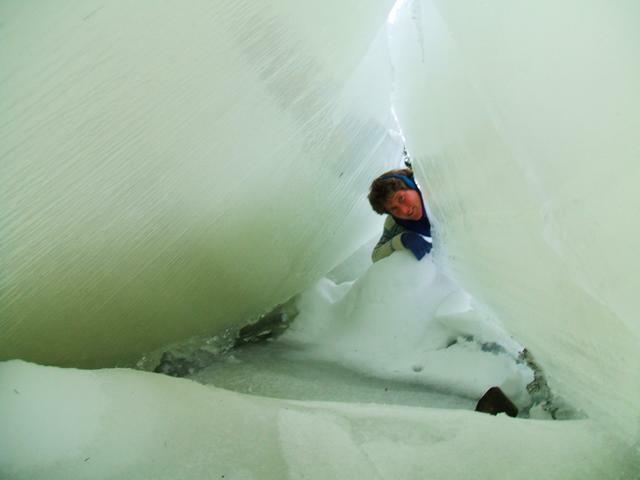 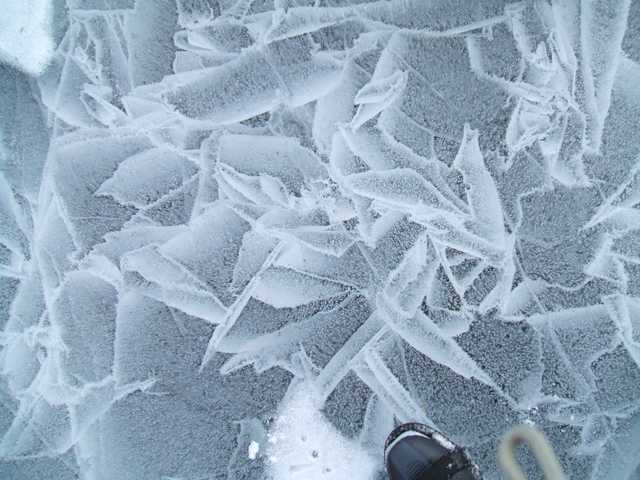 In the middle of the lake, the ice had strips of bare ice alternating with strips of high-friction wind blown snow. 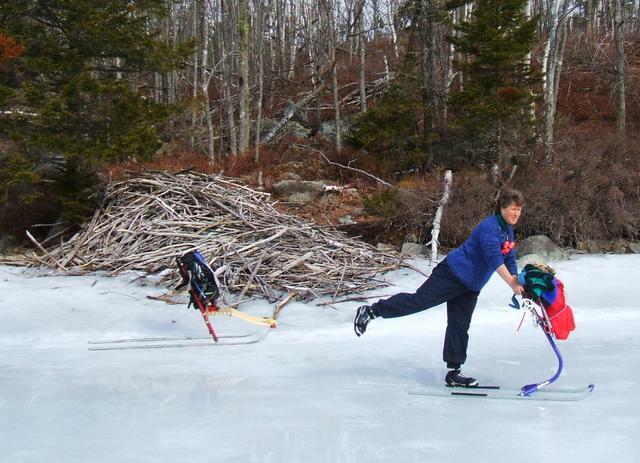 Now I know what Swedish skaters mean by the expression "braking-snow"! 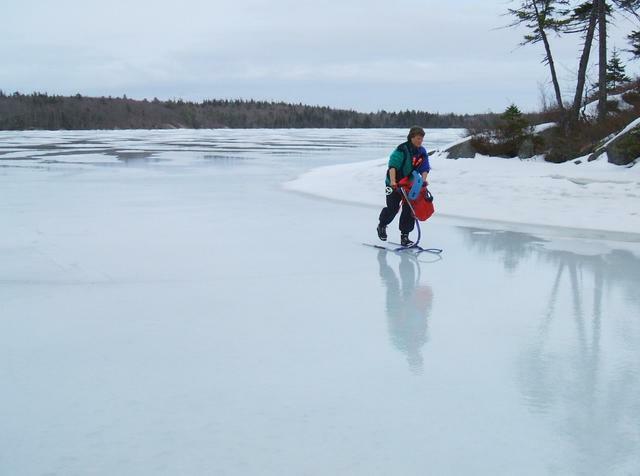 In Dartmouth the whole lake chain: Banook, Micmac, Charles was passable. 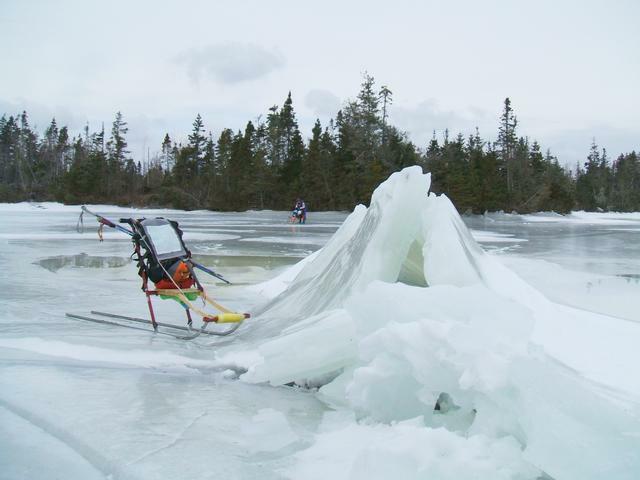 We started on the Shubenacadie Canal, and kicksledded north to the end of Lake Charles. 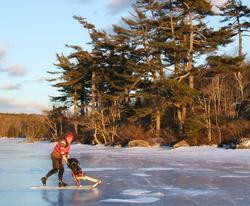 The ice was so good we decided to skate back. 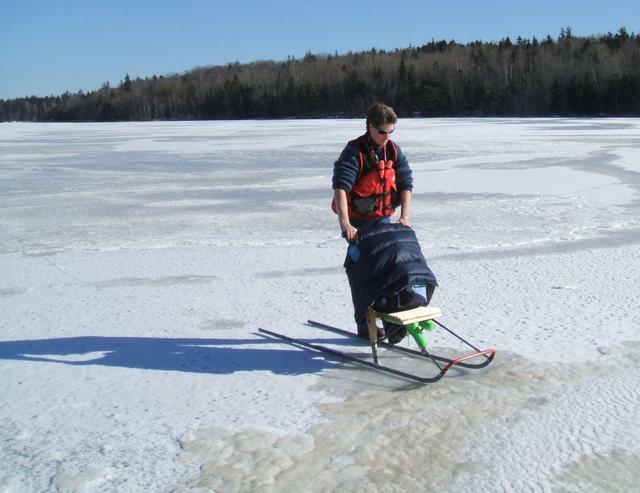 pulling the sleds behind us. 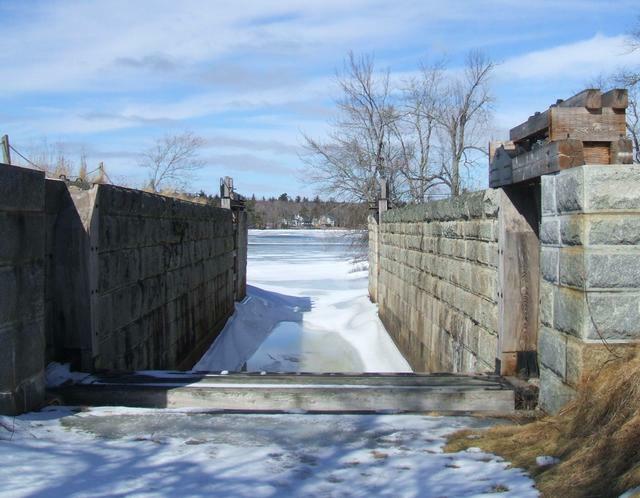 Then we portaged around the locks and skated to Lake Micmac, which was even better ice. 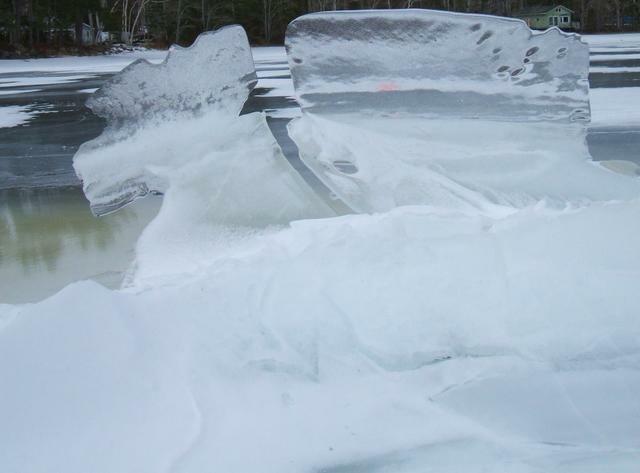 This was the first time I've ever seen the passage under the bridge to Lake Banook frozen! 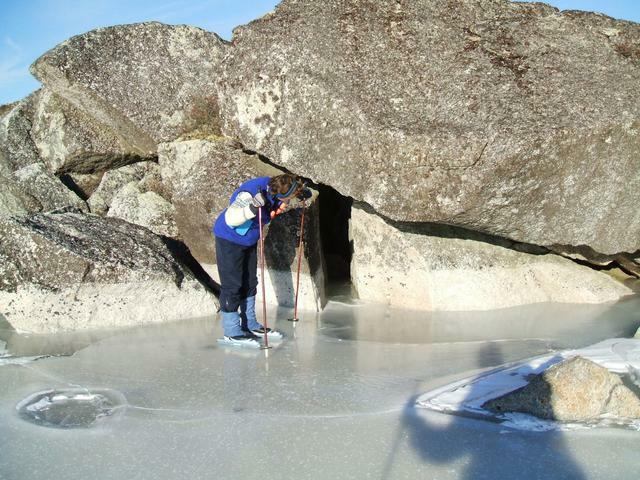 But it was covered with pigeon guano! 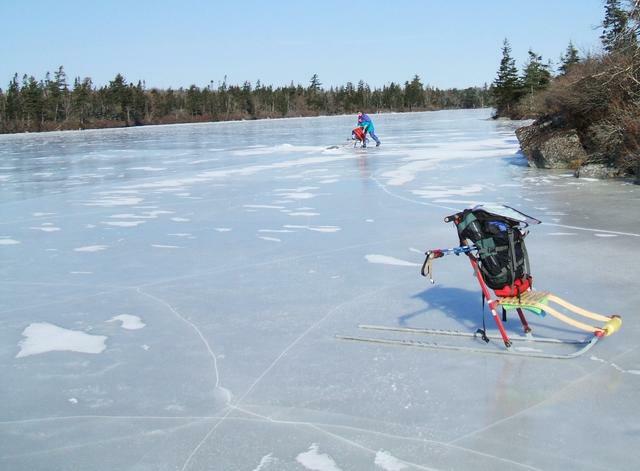 According to the GPS, the total distance skating and kicksledding was 30 km. 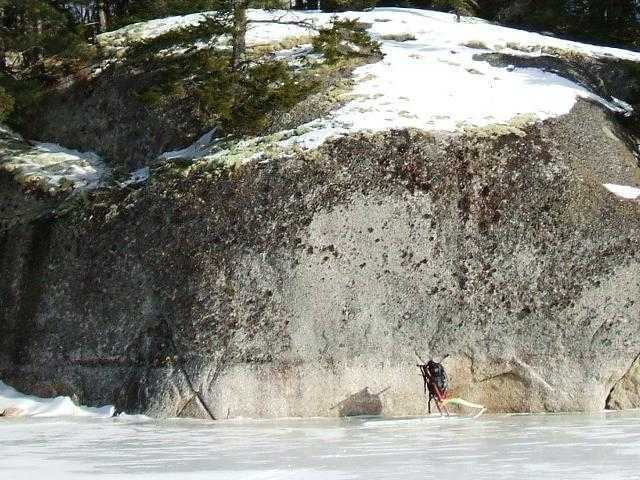 Return to Big Hubley WOW! 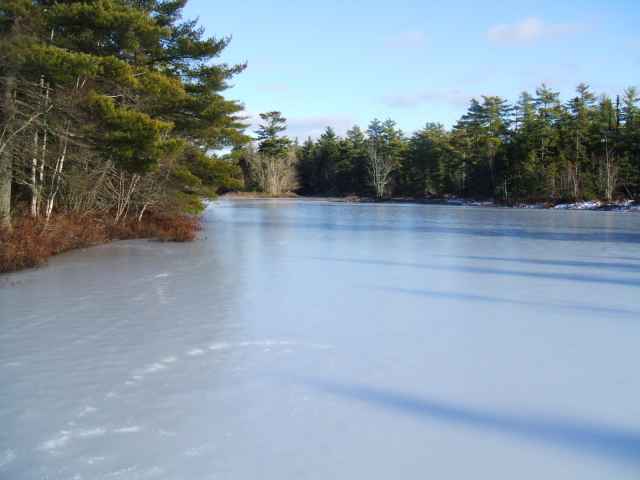 Rain from a few days ago had smoothed out the ice. 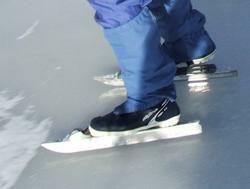 We did about 22 km, kicking and skating. 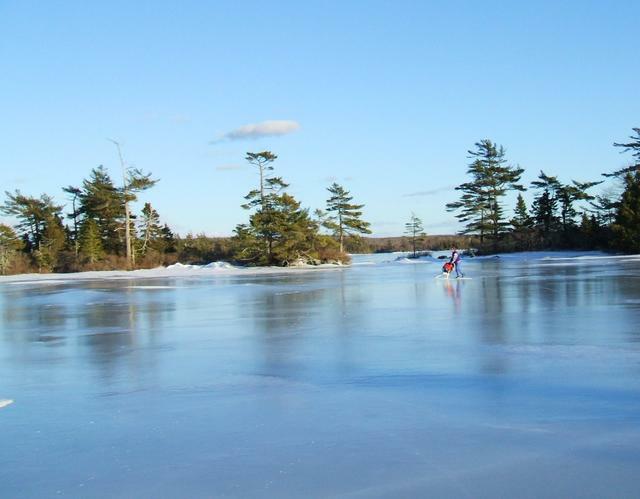 Porters Lake is connected to the ocean by a narrow channel at Lawrencetown Beach and thus is slightly salty and has a small tide. 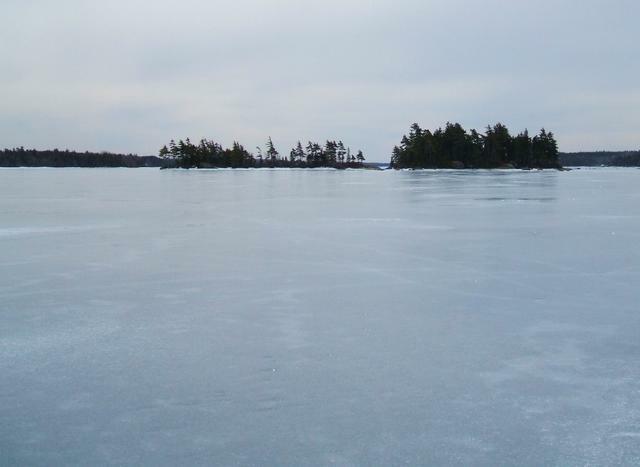 As usual, there were strips of open water in some of the narrow sounds. 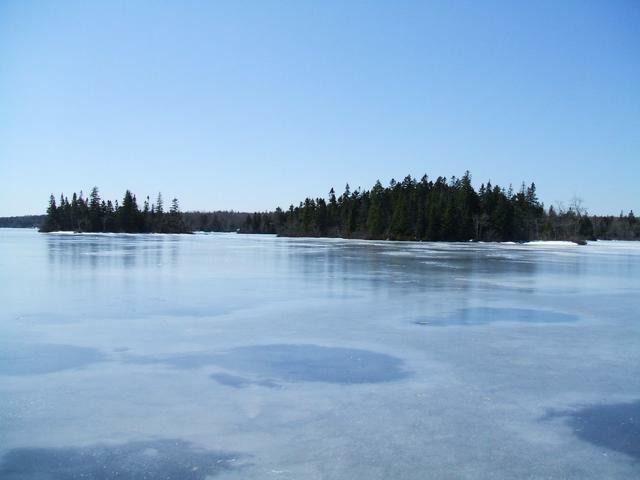 Locally called just Grand Lake, this is the largest lake in the Shubenacadie River System, hence the name. 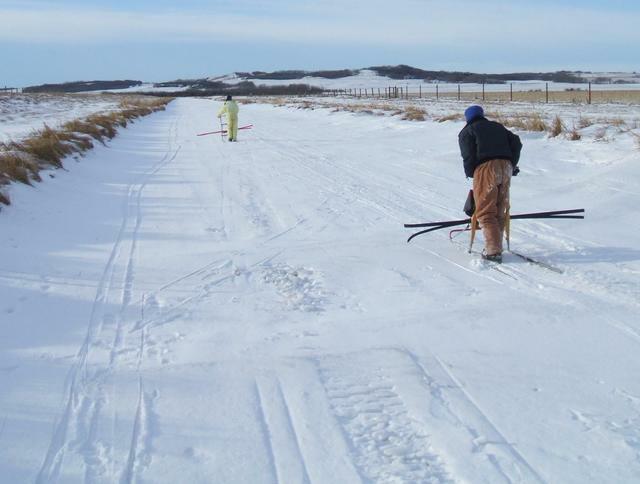 It is nearly 20 km long and 4 km wide. 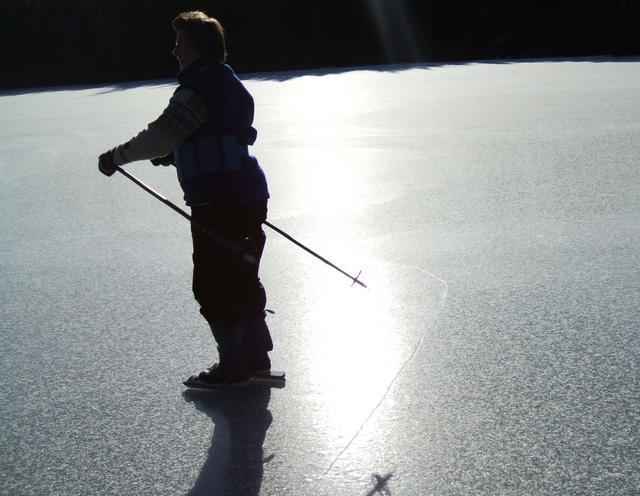 The ice was over 40 cm thick with large sections of smooth hard ice, very good for skating. 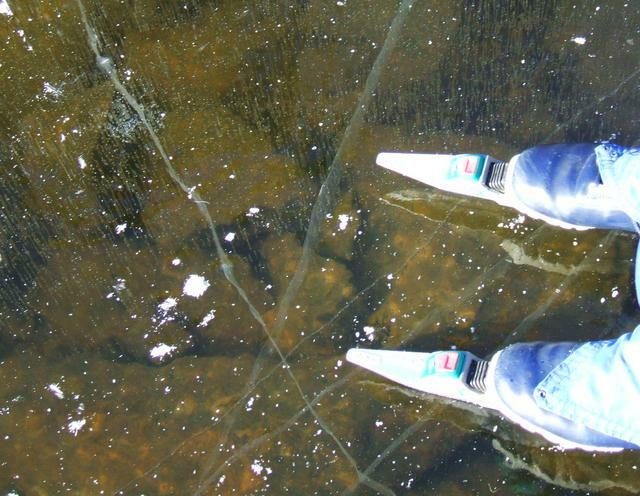 Melting snow made some puddles on the ice. 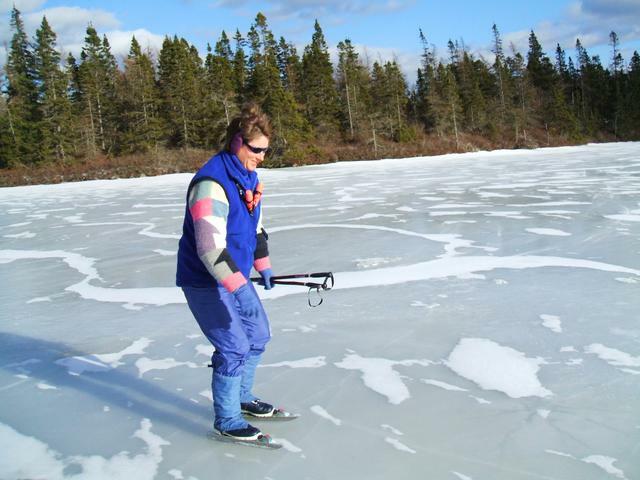 Lake George is the highest lake in the Gaspereau River system. 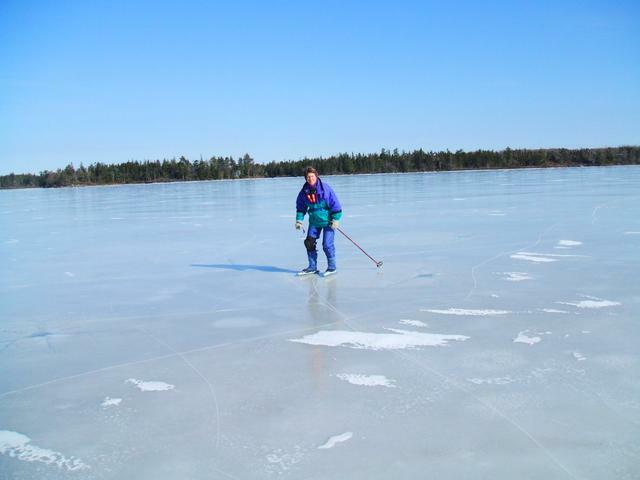 It has best ice early and late in the season. 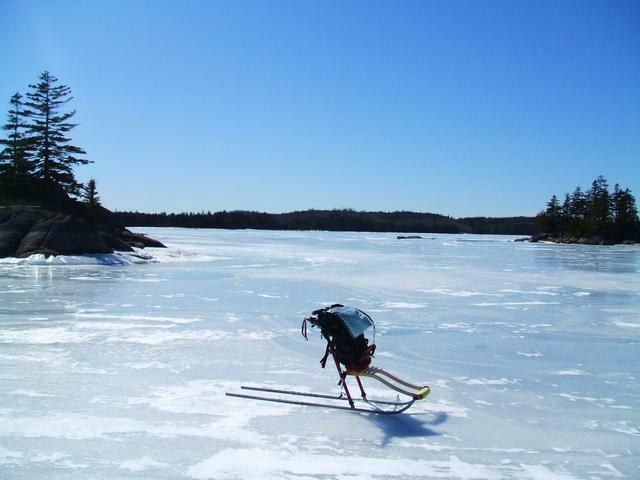 I did 18 km on kicksled and 26 km on skates on excellent ice. 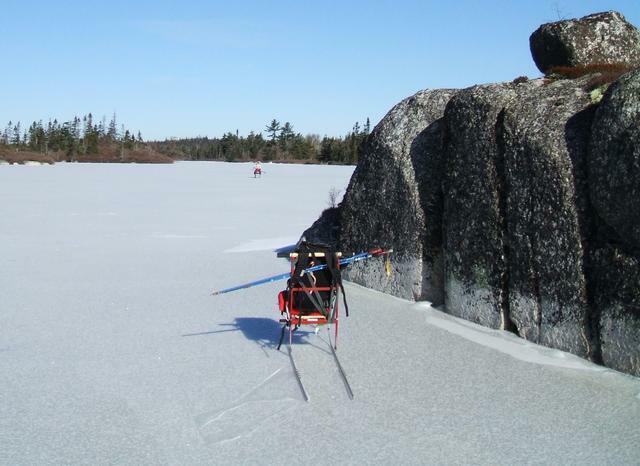 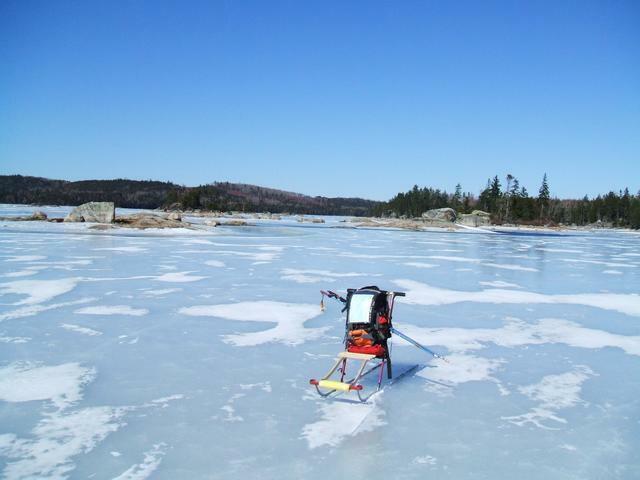 Aylesford Lake is just east of Lake George and had quite good ice. 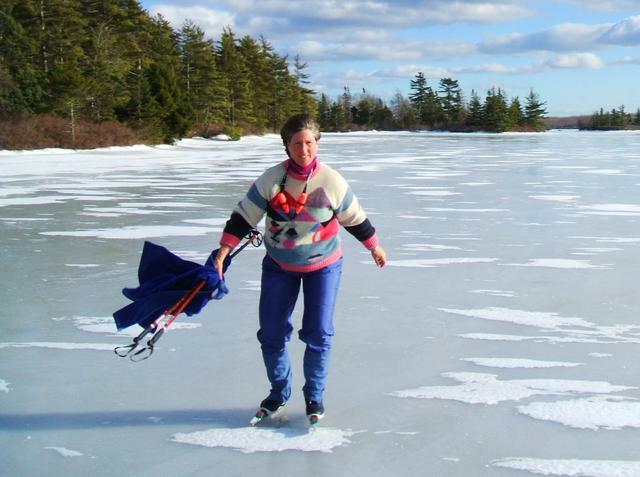 I skated the whole shoreline- about 20 km. 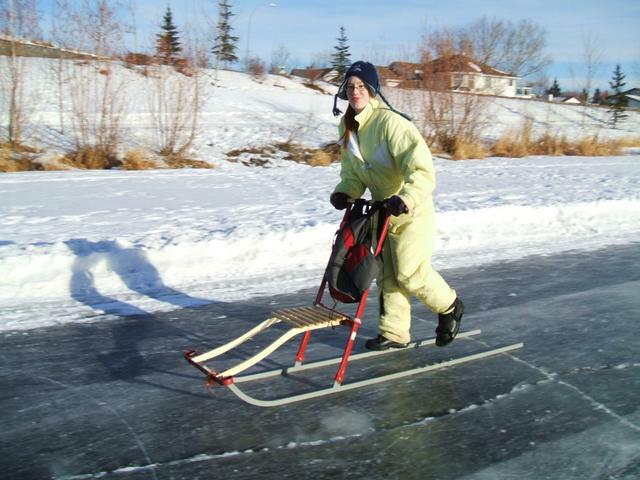 Total skating and kicksledding for the day was 41 km.